Thursday’s Kickoff Dance, from 7:00 – 10:00 pm at the Adorni Center, will feature the” best dance band on the West Coast” Stompy Jones with guest vocalist Chris Binnings. Blues fans can look forward to the “Redwood Coast Blues” program honoring Eureka’s rich blues heritage this year. You’ll be treated to nine different blues acts on Friday and Saturday evenings including Roomful of Blues 50th Anniversary Tour. The Festival’s Friday Night Barn Burner- A Dance and Western Swing Extravaganza – features Pappy & Junior’s Western Swing Allstars, The Mighty Rovers Merle Tribute Band, and Tom Rigney & Flambeau. 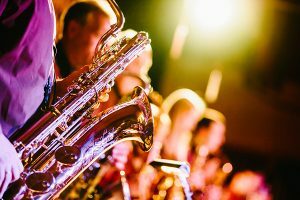 Saturday night’s Sequoia Swing will feature five different jazz/swing bands, plus the Sequoia Center’s 1800 square foot, floating maple dance floor. Sunday’s Grand Finale from 3:00 – 5:00 pm at Eureka’s Municipal Auditorium caps the Festival with a seven band spectacular jam session. The Festival venues have grown to seven, all of which offer food service, bars, and space for dancing. New for 2018 will be the intimate jazz/blues club atmosphere of The Inn at 2nd & C, a recently restored Victorian hotel. Other more intimate venues include the rotunda and atrium of the Morris Graves Museum, and the Red Lion’s bar/lounge. Larger venues include the Red Lion Redwood Ballroom, the Municipal Auditorium, plus the Adorni Center and Sequoia Center, both with professional dance floors. Visitors can step on the free shuttle to hop from one venue to another. Friday’s Opening Ceremonies at 1:00 pm at the Adorni Center featuring jazz bands the Kris Tokarski Sextet and the Dave Bennett Quartet. Arts Alive Eureka will partner with the Festival to present free music Saturday evening. Old Town Rhythm & Roots will feature 17 different bands in nine Eureka Old Town venues from 6:00 pm – 9:00 pm. Morris Graves Museum will host Gabriel’s Trumpets led by Brian Casserly, the Dave Bennett Quartet, and The Yokels. Entry is free to all locations except the Adorni Center. Restaurants, galleries and shops will be open throughout the historic district. Sunday’s Community Gospel & Concert at 10:30am at the Adorni Center, presented by the Arcata Interfaith Gospel Choir and ARMACK Jazz Band. Sunday’s Festival After Party reprises the sounds of blues, jazz, and swing at the Red Lion Hotel from 5:30pm – 8:00 pm. Visit the Festival website for additional information about the schedule, performers, and special events and shows. A complete schedule can be downloaded. Why not stay at The Redwood Riverwalk Hotel in Fortuna, away from the Festival crowds and busy hotels, surrounded by the redwood forests instead? The half-hour drive south of Eureka means you’re close to so many other attractions the Redwood Coast offer, from the Avenue of the Giants to Historic Victorian Ferndale. At The Redwood, you’ll find a personal touch. We’ll treat you to a leisurely complimentary breakfast each morning, and welcome you back each evening for a quiet night’s rest at our certified GreenLeader Hotel. Let us help you plan your trip – just give us a call or send us an email. We look forward to hearing from you soon. This entry was posted in Concerts, Events, Festivals, Uncategorized and tagged Arts Alive Eureka, Entertainment, Eureka, Music, Redwood Coast Music Festival by admin. Bookmark the permalink.